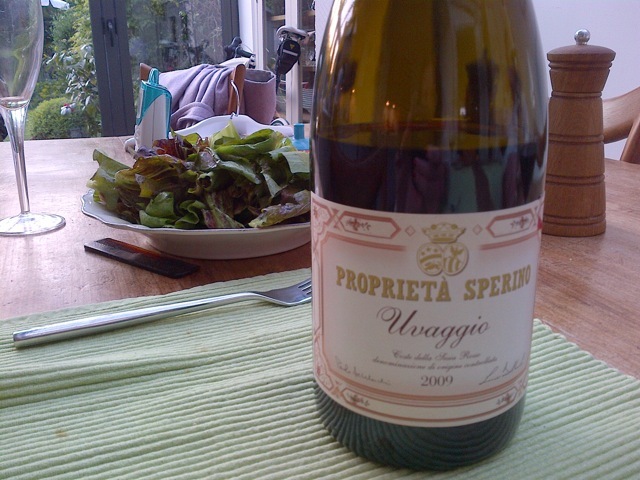 Proprieta Sperino Uvaggio 2009 Italy (13%, £16.50, The Wine Society or direct from Liberty Wine) I first drank this wine at The River Cafe on my birthday last year. It was £58 on the list there. Obviously it costs a bit less if you buy it to drink at home, but you don’t get the atmosphere or the delicious food (unless you cook very well, or know someone else who does). A Piemonte red – based on nebbiolo, but with some croatina and vespolino in there too. I know nothing about those other two grapes except that they sound good, and as if the King’s College Choir is about to burst into song. This has the finesse you want from Piemonte but it’s easygoing too. Instead of roses and tar – the classic tasting notes for nebbiolo – I’d say dried roses, fresh roses and a bit of rosehip and suede too. Piemonte reds are light yet tannic. A bit of a grapple but a balletic grapple. At the River Caff I drank it with truffle pasta. Afterwards a kind friend sent me a half case as a memory of the night. I drank the first bottle this weekend at my cousin’s with fennel-and-garlic-roast pork and celery and potato matchsticks and bitter leaves. Gorgeous. * Apparently the toilet rolls have had to go into a storage unit. No idea whether storing them is costing more than it would to buy them but calculations welcomed.